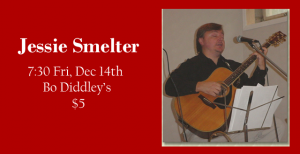 Singer-songwriter-guitarist Jessie Smelter calls himself “a wordsmith and storyteller” and writes that he has been “shaped by musical influences ranging from gospel, country, and bluegrass to folk and rock and roll” He has produced two albums of original songs. This is part of the Five & Dime Series and tickets are not sold in advance. Show up the night of the show, seating is by arrival.